When Lenovo reps at CES handed me a 13.3-inch LaVie Z HZ550 for a hands-on test, I looked at them and said, "This is just a mock-up. No way there's actually anything inside" — that's how impressively light these notebooks are. The LaVie Z laptops are the first U.S.-bound ultraportables to come out of the company's collaboration with NEC in Japan. The non-touch HZ550 ($1,299) represents an amazing feat of engineering. Its unbelievably light 1.72-pound weight (made possible by a magnesium lithium alloy chassis) is just the start. 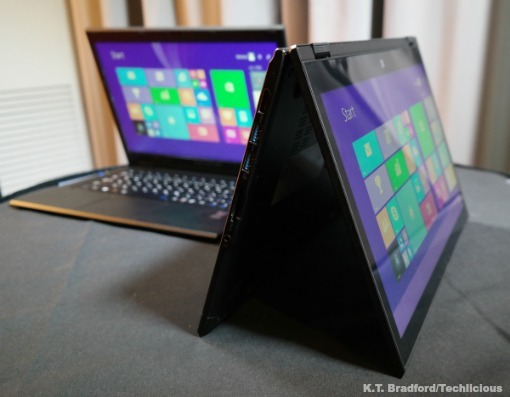 It's only 16.9mm thick yet houses a fifth-generation Intel Core i5 processor and 4GB of RAM. While that's not exactly a workhorse, it makes this laptop powerful enough to handle most typical computing tasks, even for those of us addicted to multiple browser tabs. The slightly heavier HZ750 ($1,499) is even more drool-worthy, incorporating the Yoga’s 360-degree hinge design as well as a touchscreen. The touchscreen display is what adds the extra weight, bringing this ultraportable up to 2.04 pounds. What a burden, right? The added weight is well worth it for the additional functionality. Even though the HZ750’s 13.3-inch display is stretching it when it comes to tablet usefulness, its extremely light weight and compact design make it more viable in that mode. Just like the Yoga, you'll be able to configure it in tent and stand modes. Choose from two configurations, Intel Core i5 and 4GB of RAM or Core i7 with 8GB of RAM. For most people, these options are powerful enough for any task outside of specialized apps. The aesthetic of both LaVie Z models calls to mind the ThinkPad line, though these are not ThinkPads. They're not quite as good-looking as the Samsung ATIV Book 9, which is also seriously thin and light. The LaVie Z HZ750 is still lighter by 0.02 pounds, but the Book 9 is thinner — 0.46 inches versus the LaVie Z’s 0.65 inches (16.9mm). Minute differences in measurements aside, the LaVie Zs will likely give Samsung and Apple some competition among shoppers looking for light weight and compact size. The winner will be determined by performance and usability. How the chips inside these ultraportables perform still remains to be seen. But in terms of keyboard and touchpad design, Samsung may have the advantage. If there's anything to complain about on the LaVie Zs, it's the keyboard. Its square keys felt okay but didn't blow me away during my short time poking at them. That said, this is a minor complaint, and I may feel differently about them after typing for longer periods. So far, the Book 9's keyboard feels best. Battery life is another opportunity for the LaVie Z to stand out. Despite its thin profile, its battery life is supposed to be in the range of "all day." There are no official numbers yet, but given the power-efficient hardware inside, I have a strong hope for something like 10 to 12 hours. We’ll see when the laptops come out in May.